Magic is just the beginning to a lot of things when Jenario takes his first peek into the new world. While this sets the scene to the next trilogy of Red Moon Rising, it diverges from the main story line to flesh out the original four humans who discovered Healers and their magic. While creating the second set of books, I was stumped to organize my notes for book 5 and 6, but not book 4. There seemed to be a gap of information, so I asked myself the question: Why did Jenario create the Dark Unicorn? Was it simply for power? Did the four friends split up because of conflicting interests? Or was he merely a tool used by Nature in order to save Healers and bring the Elements back together? I believe that any of those questions are possible. As I delve into story development, I’m discovering a side to each person that’s both interesting and puzzling. The more I plot out details, it’s becoming clear that Jen wasn’t always the self-sufficient alchemist he’s made out to be. Another reason to do a prelude is to tie up things that I had not previously thought about. For example (and for those who’ve already read the first set of books), there are three main castles in the story. We’ve got Luxor, Castle Mire, and the Gothic-looking place where Jenario lives – which does not have a name. It never did. Some things I never developed. Yet in this story, Jen’s home gets a name…and for good reason. With this story, however, and as I’ve seen in some others by well-known authors, I’ll have to take some creative liberties. Some of the people’s ages might not match from the start of the series. This is because some of them have children, and I’d like to show how they affect the characters that was suggested when I started the series. Keep in mind, I’m still developing, so there might be a way to get around it without people noticing. Still, fleshing out any story is the highlight of my why I write! The streets of the old city were silent. Colorless, as Jenario saw it, like the winter sky threatening to flurry at any moment. He fixed his gaze back to the lone corner, hoping no guards were on patrol this late at night. Closing his eyes, he thought over the escape plan. When he reopened them, his uncertainly was no different than his cold surroundings. It was pointless to turn back now. He felt an inner pocket where he had last put the list of names. When the sound of crimping paper met his ears, he gave it a good pat before moving alongside a shadowed building. The list was proof enough that the council was targeting people. Jenario had even seen his own name, among countless others he recognized. At the corner, he held his breath before peering around its side – empty. He released his breath in a puff that he could see in the frigid air. Get a grip, Jenario Onyx! You know the plan as well as any. Just wish the night were over! With the side streets vacant, he then turned and motioned for a small band of citizens to creep from shadow. To be caught past curfew was considered a crime, no matter the reason or age. It was night duty of a leading council member to watch over the streets. Yet the four who were responsible were the very ones organizing the escape. Each night, one member of the council led a group from the city. Tonight would be the last, and it was Jenario’s watch. Can’t mess this up. Ahead, he could just make out the dark crimson outfit of Shafari waiting at the main gate. For many years, they had served together on the council, a council that seemed to be targeting those with magic. It was no surprise to read his friend’s name on the list, though for now he kept it a secret. “Wha—” But by then Shafari had already moved ahead, leading the people out into the wilderness. Jenario sighed in a huff and made his way over to the control quarters just a little ways to the far right. The plan was simple. Shut the gates. Make it look like nothing happened. Time it so he could run out. Join the others. Yeah. Simple. Once in the control room, he reached for the wheel that connected to a pulley system. A good tug unusually set its ball-and-chain mechanism in motion, but Jenario was finding it a little difficult this time. Thomas Gracie must have had help with this! He put all his weight against it, hoping to hear the clank of giant iron chains and cannon-sized ball weights activate. If the weights rose, the gates opened. Lowered, and the gates shut with a force that no man without proper strength could get back open. The wheel suddenly gave, nearly taking his fingers off in the process. He staggered back, holding his aching hand as the familiar clank of chains rotated on its pulley system. Now he just needed to get through the gates before they shut. The mechanism was slow, so Jenario took a final look at the gray buildings he had accepted as home for many years. He had met his beloved here, Tia. She would be with the others by now, safe from the clutches of the council. Anger stirred when he found her full name printed on the list: Jileathia. Although she had not accepted the name Onyx just yet, they already had a two-year-old son. The city just never suited the married way of life. Yet, with the promise of leaving, Jenario hoped she would reconsider. The chains’ rotation was nearing an end. Jenario turned to scoot through the gates when silhouetted movement caught his eye. A thick arrow splintered against the heavy doors. A second zipped directly behind his chin. Jenario dived through the narrowing gap before a third ricocheted off a wall. They started tonight? Jenario scrambled to his feet, flinging dirt from his hands in the process. He darted after Shafari’s group with little hope they would escape when those gates were let back open. He forced his legs to pump harder. It was Thomas Gracie who grabbed him and swung him over into the thicket. That patch of white against thick black hair was a dead giveaway. Soon, Jenario’s pounding heart settled enough so he could speak. In the distance, they could hear the echo of chain clanking in reverse. The gates, to their dismay, were being opened. “They’re coming!” Jenario started to get up, but Thomas Gracie held up a hand for silence. Footsteps drew their attention to the lone magic-user Shafari. Through a thin opening in the bramble did Jenario watch his friend lift a hand toward the city. Soft murmuring confirmed one of his dilapidated spells, and for a moment Jenario thought he would laugh. Is he serious? Yet when he saw a red glow fill the palm of his hand, Jenario began to wonder. He could still hear the clank of chain, seeming to pause a moment. Then, as though someone viciously pulled on it, the chains pounded against the side of the gates until something heavy slammed down with a loud crack! Thomas Gracie was the first to climb from the thick branches while Jenario struggled to get his footing. Random twigs kept scratching at his face or clinging to his vest. His noisy struggle silenced all other conversation until their friend stumbled out to the road, though not without tripping over some roadside bramble and falling face down in the dirt. He lifted his head to witness the first sign of snow beginning to fall. It settled over the dirt in front of his nose before the hand of Thomas Gracie blocked his vision in attempts to help him up. Jenario quickly accepted. “What do you mean?” Jenario dusted himself off and squinted in the distance to what the thunderous sounds had meant. What he saw gave him chills. The weighted balls still glowed faintly, the light seeming to hold it against the outer wall that now had a giant crack up the side. The gates, he realized, were stuck without a functional pulley system. “So much for being foolproof,” Jenario murmured, but his friend flashed a look in warning. “Foolproof?” Shafari’s tan eyebrows lowered in annoyance. “It was foolish to believe it couldn’t be broken. I’d like to see them get it fixed anytime soon, ha!” He turned down the road that led deeper into the unknown with his companions following. Jenario glanced around the dark woods lining either side of the path. He had no idea where they were headed or how far the other group had traveled ahead of them. YOU ESPECIALLY, Jenario wanted to say, but remained silent until they reached a makeshift campsite. Through magic, Shafari had marked a path only he could see off the main road. Soon they could hear the rustle of canvas tents being packed and the clink of cups and utensils finishing a quick meal for those who had arrived earlier. Nickademis must have known the three were close, for the doctor was already heading their way when they came through the trees. His bearded smile was a relief to all three that they had safely escaped the clutches of the council. Now all that was left was putting some distance between them and the city. At the far end of camp Jenario spotted Tia. His wave received that warm smile he missed ever since departing that morning. His attention soon reverted back to his companions. Shafari frowned, mumbling an incoherent curse under his breath, of that Jenario was certain. Since the council had built up a reputation of disliking magic, those with the ability had to ever hide it or leave. For those powerful enough to produce more than simple fireballs or illusionistic lights, practice time to keep control of their powers was limited. Yet being on the council had its perks, as night watch for Shafari meant no one would be around – plenty of time to practice. FOR WHAT IT’S WORTH. Jenario thought back to instances of abnormal plant growths and wrecked rooms of overturned, broken furniture. For Shafari, practice was never enough. Agreeing, the four separated to their respected sections to help with packing. Tia had the majority of their things already packed by the time Jenario crossed the clearing. A refreshing kiss on the lips kept the chill wind at bay a little longer before slowly drawing apart. Her pixie-cut hair wavered in a brisk breeze as she held up a wool cloak. “I knew that outfit wouldn’t be warm.” She helped wrap it around his shoulders, its dark color similar to the one she wore. “Better not keep them waiting.” Jenario gave his fiancée a quick peck on the cheek, then stepped around to help. “Everything in order, Nicholas?” He grabbed one of the bags and swung it onto his back. “Yes, Sir.” Nicholas gave a sharp tug to make sure nothing fell out from the canvas sack. He started to pick up the smaller ones while Abraham ran over to his father to hug his leg in play. Tia held out a hand for her son to cling to while Jenario and Nicholas finished collecting their things and headed out. The clearing was fairly empty, as their family was last to depart. By now, the snow was falling so thick that it did not take long for their tracks to disappear completely. It was easy to lose track of time, especially when everything looked the same. Snow blanketed the earth so deep that Jenario had to carry his small son at times. He worried about the cold getting to him, for every now and then his little body shook in a coughing fit. Hours turned into days as the group continued to follow Thomas Gracie and Shafari’s guiding light he managed to conjure when nighttime fell. When they finally stopped to set up camp, Nickademis made sure to go around to each family to assess their health. Several had already taken ill in the severe weather, and it was only getting worse. Jenario was glad Nicholas was around to help pitch the tents. He wanted his family away from the wind as soon as possible, but it was taking longer due to the deep snow. They dug out as much as their numb fingers would allow before nailing long stakes into the hard ground. When they were done securing shelter, Nicholas started toward another family who was struggling to pitch theirs. “You’ll be all right, Nicholas?” Jenario called after the teen, who replied with a single nod. After making sure his family was safely inside, Jenario checked a couple of his personal belongings. He counted the various sized vials and glass containers Tia had managed to grab from his secret home lab. While a few were empty, most contained ingredients for when they settled long enough to start testing his alchemy again. Satisfied that none of his vials were damaged in the move, Jenario checked on their food supply. It was low. Wondering how others were fairing, he made his way out in the blustery wind to find Thomas Gracie. “I’ll be back,” he promised before securing the tent flap once outside. A sudden gust nearly stole his breath, and he staggered back in surprise. THE COUNCIL NEVER NEEDED TO DO ANYTHING, he thought in disgust. IT WAS ALL A RUSE JUST TO GET US TO LEAVE. THEY KNEW THE WEATHER WOULD FINISH THE JOB! Holding both sides of his hood, Jenario fought against the wind to locate their leader’s tent. The snow was blinding, often blowing in his eyes with no way to rub out the sting. He flexed his fingers, trying to keep them from cramping up inside his wet gloves. They were not made for this type of weather as he buried them instead beneath his wool cloak. With nothing to keep his hood secure, it blew back in the storm’s fury. Head bowed, Jenario plowed forward. He missed his name being called over the howling wind, but when he lifted his head he was relieved to find light closing distance. Then all went still. No wind or snow beat against his cloak or blew back his hood. Instead, it beat against a shield that encircled his body when Shafari joined his side. “I’m good for some things, right?” The magic-user smiled in content with his doings and led the way with a ball of light dodging snowflakes across their path. Jenario was just happy to finally enter Thomas Gracie’s tent. Dousing his light, Shafari went over to sit next to Nickademis. The doctor was still shaking snow from his long coat as Jenario joined Thomas Gracie. A low flame was enough to heat up a tin pot, and soon warm drinks were being passed around. Jenario could not stop thinking of Tia as he took a long sip. The warmth of it settling down his chest chased away a stubborn cough. His fingers wrapped around the tin’s hot edges, hardly noticing his flushed skin when it felt so much better than being outside. “And they’ll hold?” Thomas Gracie eyed the crimson magic-user before taking a drink. There was a brief moment of silence while everyone just sat watching steam rise from the kettle. Now and then a slurp from their cups interrupted the howl of wind and flapping canvas parts not totally secured outside. It was in this moment that Jenario thought about the list. Reaching beneath his cloak, he pulled out the folded parchment and handed it to Thomas Gracie. Nickademis’ face turned a shade redder in sudden anger. He slapped his cup down, splashing some of its hot contents on Shafari’s sleeve. Shafari rubbed the stain from his clothing with a disgruntled look. “Doesn’t look like Nicholas was the youngest, either.” He glanced toward Jenario, who dropped his gaze at the thought of his young son being a target. “Just because of the magic?” Nickademis was still on a tangent when Thomas Gracie located his own name. At this, Jenario gave him a dirty look that read, NOT THE TEA THING AGAIN! For a moment, Thomas Gracie just stared at the list. His friends waited. “I knew too much,” he finally said. With a nod, Jenario tucked it back inside his shirt. Nickademis leaned back with crossed arms. The swell of anger had lessened, along with the red in his cheeks. He sighed loudly. “Let’s start at first light,” he said. “The storm would’ve let up by then so they can better see—“ A sudden crack outside the tent shut his mouth. Startled, all four perked up to listen to the sounds of splintering bark ripping nearby. The jolt across ground sent shivers down Jenario’s spine. Being closest to the tent opening, he flung the flap open to peer outside…and gasped. “Get out! Get out!” His desperate shouts jolted his friends into action. They scrambled out just as several large trees rolled down the slope. Shafari nearly dived onto the others when a thick mound of snow-covered tree trunk nestled overtop their belongings, crushing everything into the snow. “Or perhaps we can start now.” Jenario’s voice came in a breathless squeak, concerned that more might continue toward the other tents. For now, the trees remained still in the blustery night. “Probably blast more than we want,” Shafari said dully. “I wouldn’t recommend it since the snow is still soft. Might bring more of THIS down on the group.” He pointed to their crushed belongings. Jenario held the lantern out so he could better see through the winding trees. His other hand rested against a pocket containing a pebble – Shafari’s version of a tracking system. Both he and Thomas Gracie carried one, which the magic-user swore he could find should they get lost. What about a protection spell? Why not that instead? He glanced over to his companion, who was busy looking off to the right. The wind was not as harsh once off the open road. Still, the crack of weighted boughs overhead gave Jenario the chills. “Sure, just walk straight.” Thomas Gracie chuckled. “Besides, we’ve got these.” He patted a side pocket. Flashbacks of broken furniture kept coming to mind as Jenario tried to keep his balance in the deep snow. The words, “Look out!” did not register fast enough. A loud crack drowned out anything Thomas Gracie tried to say before both men dodged a clump of snow falling between them. Jenario lost track of his lantern down an embankment. With everything covered in white, he had not noticed the dip beyond the set of trees he dived between. He watched the light disappear first before the soft snow gave way, and he followed after. It was as though a wave of white washed over him. It was all he could see as he tumbled down the hill until he finally came to rest. Sprawled out, he figured his position was similar to the snow angels children made along the streets of Mayla. As strict as the council was, they did allow for some fun – but not much. Keeping up with their studies was more important than being with family, and most were enclosed in schools to be taught what parents were not aware of, save for council members. Being a member had given him and his friends access to those teachings, rules, regulations, punishments, and more. Jenario was only glad his son would never be a part of that system. His cheeks stung from the wet cold pressing around him. It was a struggle to dig himself out and stagger to his feet. He wiped snow from around his eyes and glanced around the area. Thankfully, his lantern was still lit and slightly protruded from the snow not far from his landing spot. With limited vision, he quickly scooped it out and held it aloft to better see. Light played along a rocky cliffside, long tendrils of icicles clinging to overhanging edges. The sound of wind whipping across hollow space suggested an opening. Jenario trailed the light down to his left until it failed to penetrate the dark mouth of a small cave. It was just large enough where a grown man could walk inside. He peered inside. I NEED MORE LIGHT. Too dark to see how far back it went, Jenario checked the hillside to see Thomas Gracie’s light at the top. Jenario waited, following the sound of crunching snow as Thomas Gracie made his way down the slope. It did not take long for him to join his companion in front of the cave. Jenario followed his companion, the extra light allowing for a glimpse into the back caverns. The farther they walked, the more they realized the tunnels split between a left and right path. Thomas Gracie paused in front of the left passage and directed his lantern over to Jenario’s right. “Oh, just making sure no bears linger around, that’s all.” He winked before entering the tunnel. Jenario sucked in a breath before proceeding to the opening off to his right. He swung the lantern around a bit just to make sure it was clear. Then he entered, hating the sound of his boots crunching over small pebbles and tripping over the occasional stalagmite. Anything here would know instantly where I am…however far down this goes! His foot caught against a stalagmite, jolting him forward in a flailing attempt to keep his balance. The lantern scraped across rocky surface, busting one side of the glass. While fragments streamed down the side wall, Jenario had no choice but to let go so he could bring up both hands in time to catch his fall. He was lucky no other stalagmites rose under him as he listened to the lantern skid across uneven floor. The palm of his hands burned where they had scraped the rough ground but managed to push himself to a sitting position. Ahead, the lantern winked out. Jenario stilled himself, trying to listen for any other sounds. At the moment, his weathered breathing was the loudest. Despite his attempts at keeping quiet, the rustle of fabric and creaking leather boots still echoed down the tunnel. He thought about calling to Thomas Gracie, but dropped the idea. I can’t even hear anything over myself! How am I supposed to hear him, let alone expect him to hear me? Jenario squinted, barely making out a bend in the passage just ahead. What should have been complete darkness turned into a search for a possible light source. 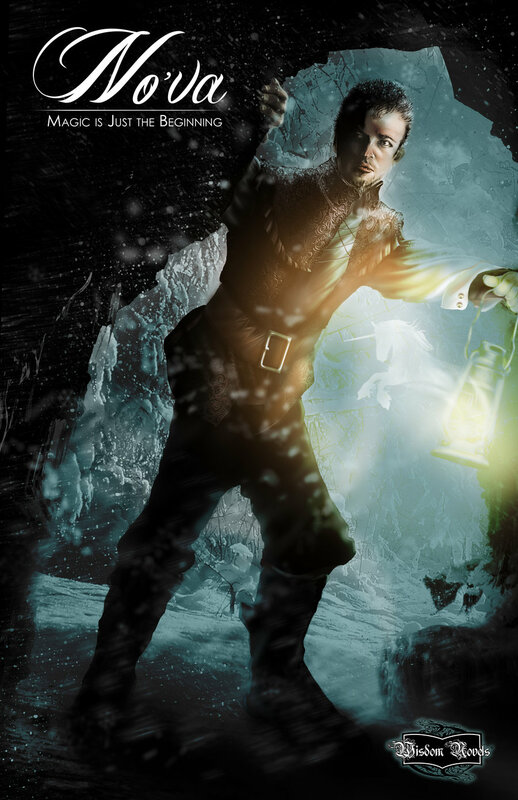 With his lantern now useless, he left it where it lay, though he could not avoid the multitude of shattered glass cracking under his footsteps. As he turned the corner, the walls took on a slightly different hue. A blue glow faintly illuminated the cavern walls. It was enough to see some of his breath rise in the frigid air. A returning echo of his question was the only response. Jenario pressed on, the walls slowly brightening the farther he walked. A chamber off to his right seemed to contain the source, so he hastened his steps. When he reached the room, he cautiously peered inside as if half expecting some frightening spectacle to jump out at him. What he saw instead drew lines of confusion across his brow. An oblong mirror rested within a wooden frame. Its base was built to allow rotation for better viewing. Even from a distance, Jenario could make out intricate details carved into the frame itself. A crest of flora at the top secured the mirror in place, with its center being the source of light. Like a curious child, Jenario was drawn in fascination. His mind was a whir of questions. Shafari would love this! He’d be analyzing its magic and have an answer in no time on how it works! Remembering the pebble, he felt around in his pocket to see if it was still there. Wonder if he can be summoned? However, his fingers came away empty. It must have slipped out when I fell…twice! Ashamed at his clumsiness, Jenario stood basking in the mirror’s light and wondering what to do. It felt warmer the closer he came, until he felt the need to remove his cloak. A snarl from behind made him turn just as a grey wolf charged. When it leaped at him, Jenario held up his hands with a shriek. Instinct jerked his body back – straight through the portal! He landed with a thud on a grassy patch as the wolf sailed overtop. When he uncovered his eyes, he lay with everything upside down in his vision. The wolf stared back at him for a few moments before turning and trotting off into the forest. “It’s…spring?” Jenario blinked. He was outdoors, but there was no snow. Leaves wavered in a warm breeze when he gazed up into the canopy. It was still night. A full moon shone brightly in between the movement of leaves. He squinted at its unusual coloration. Its bottom hemisphere was stained a blood red that slowly faded to the milky-white look he was accustomed to. Confused and still slightly dazed from his crash-landing through the portal, only one thought came to mind. There was no telling how far into the mountains the tunnel went. With a single lantern, all Thomas Gracie could see was a small amount of light passing over gray stone wall. He was careful where he stepped, as the cavern floor was uneven. Stalagmites littered where water had contorted the stone with mineral deposits over time. Some were fairly large spikes, which Thomas Gracie picked his way around. He dipped to his left, avoiding a low-hanging stalactite. Another nearly caught his shoulder. It must have leaked through this part. He hunched low to keep from smacking a whole family of them. Wonder how Jenario’s fairing? He had to laugh, then listened to the echoes of his solitary musings fade down the tunnel. It was too easy to imagine the young man smacking into one of these long rock formations, though he hoped no injuries occurred in the frigid weather. Nickademis already had his hands full back at camp. Adding one of the four leaders would only dishearten the group from a survival perspective. Gradually, the tunnel curved to his right. He was almost positive it connected to the one Jenario had gone down. A few others branched off here and there, but nothing that contained questionable sounds other than his own echoing movements. “Jenario! Can you hear me?” He thought it odd no echoes could be heard anywhere else. A little farther down he called again. Maybe I’m wrong. Maybe this doesn’t connect. But if that’s the case, then where does it lead? It has to be parallel to Jenario’s! As if to answer his question, the lantern’s light finally revealed a dead end. To his left, a smaller opening continued with the possibility of connecting to his friend. With a sigh, he contemplated turning back. Having told Jenario not to veer from the main tunnel, Thomas Gracie was not about to chance his own luck. Other than watching his step, he had proven the cave empty – at least on his side, and he hoped Jenario’s was same. The thought of bringing in the group deemed safer by the minute. Even if the air is still cold, at least we’ll be out of the wind. About to turn back, a hint of blue caught his eye. It was a faint glow that illuminated the side tunnel entrance, so low in fact that his own light source had overpowered it. But once he turned away, the glow remained. Curious, kept the lantern behind him to better see. Jenario doesn’t have any such light. Should I..? He peered into the opening. There was something traced into the wall. The etchings themselves cast a faint aura that flickered along the mark like a slow pulse. Intrigued to its meaning, Thomas Gracie decided to take a chance. He stepped through the opening. As soon as his foot touched the inside floor, more symbols lit up as though activated by his mere presence. Not one, but four of these marks, lined side by side down the wall. Thomas Gracie just stared in stunned silence. He finally stepped close to the first one and watched while the blue light faded away. It was hard to see anything once the color dimmed, but he swore the symbol looked like waves of water. He stepped to the second. This one revealed a fiery crimson that reminded him of Shafari’s attempt at spell-casting, and he wondered if the two were related. The mark’s shape resembled something like fire before it too dimmed. The third was harder to identify. Its fading color had been a light teal tracing several swirls winding into the stone. It reminded him of a drawing Jenario’s son had scribbled out one day. The simple forms of clouds swirling onto the top part of the paper slightly matched the etching. Maybe it represents the sky? Unsure, he moved to the last mark. It was the easiest to recognize, being the shape of a leaf. Like all the rest, its green lighting faded until Thomas Gracie had to raise his own lantern again to see in front of him. Someone had to have made these, but for what purpose? What does a leaf, a cloud, fire and water have do with anything? The tap of toenails over stone floor echoed from the tunnel he had just been in. Frozen in place, Thomas Gracie held the light steady as the tapping drew near. When a low growl penetrated the silence, he knew a hungry wolf was about to enter. He started to back away, his light no longer able to reach the spot where he was sure the wolf’s head had appeared. Now only two glowing orbs of white reflected from what little light reached them, but it was enough to make Thomas Gracie turn on his heels and run. Armed only with a lantern, as the council prohibited weapons, his only defense was to flee. Why didn’t I think to grab something from one of the Trappers? As a master huntsman, A Trapper was granted this title if the council approved their successful hunts. There was only one in the group, as the rest had been too proud to consider leaving the city. It was these the council had promoted to guard duty, and probably were the same tasked with eliminating those off Jenario’s list. Thomas Gracie did not hear anything advancing after him. His steps, however, did not slow. He wanted to find Jenario and hoped he was on a connecting path. As he ran, the same four symbols lit his way, dimming when he approached and flaring up again when he had passed. The interest in them had vanished, replaced now by a rising fear that something may have happened to his friend. “Jen—” His call was cut short when his foot tripped on a stalagmite. The lantern went flying, and so did he. All he could hear was shattering glass and the echoes of his own painful grunts when his arm scraped against jagged floor. He lay still, waiting for the tunnel’s returning mimic to calm itself. Nothing approached from behind. Not a footfall, a pant of breath – had he imagined the eyes in the dark? Frowning, he pushed himself up and brushed a patch of dirt from his pants. Pull yourself together! You can’t go back with your wits a wreck when people are relying on you! Thomas Gracie fumbled with his belt, readjusting himself after the fall when he paused. How come I can still see? He checked the spot where the lantern had stopped rolling. Its glass exterior lay scattered around the tunnel floor with no lit center. The crash landing had completely drained all the oil needed to light another wick. And yet, there was still a faint illumination that outlined the cavern walls. Curious, and deciding against returning in the dark without a proper light, Thomas Gracie continued. As he rounded a corner, the air felt slightly warmer. Has someone managed to light a fire? For a split second, his mind conjured a horrid image of Jenario’s clumsy nature somehow lighting himself on fire. He quickly threw the idea aside. Even so, the air wouldn’t feel like this so quickly. There’s something else here. Another tunnel just ahead confirmed where the light was located, as a blue glow lit just inside the opening. The closer he came, the warmer the air felt. His heavy, winter clothing was not the proper thing to wear in the changing temperature. By the time he peered inside, Thomas Gracie had already removed a layer. It was obvious by the cloak that lay on the floor that Jenario had also been in this part. Yet he was nowhere to be seen. The only other thing in the spacious chamber was an oblong mirror contained within a wooden, swivel frame. Light poured from its reflective surface and caught his own puzzled expression when he took a step closer. The air was warmest around its structure. “Jenario?” Unless his friend had turned back, the room was otherwise vacant. The amount of light brightening the space allowed a glimpse to the far back wall. There was no other way in but the way he had come. With a sigh, Thomas Gracie stared into the blue glow and wondered what to do next. The group could use a little warmth, but how is this possible? Can I move it? He reached out to touch when the image began to waver. As if a veil uncovered the truth, the mirror vanished, replaced by a single, oval ring hovering just above ground. Thomas Gracie had heard of portals, just never seen one. Fascinated, he watched until the opening revealed the location of his companion standing just on the other side. Hesitating, Thomas Gracie slid a finger over where glass should have been. Yet instead of touching hard surface, it slipped beneath the rippling image to tap the shoulder of his friend. Jenario jumped at the unexpected touch. He whirled around in time to catch a pleasant, yet somewhat relieved smile as his friend stepped through the portal. “Am I ever glad to see you!” Jenario wiped his brow and tried to recompose himself. Jenario hesitated. “So you expect to just wander around in this nice springy weather while everyone else freezes?” A hint of anger rose in his voice, but Thomas Gracie reassured him. It was then that Jenario noticed that his friend no longer held a lantern, nor did he see it through the portal where his cloak was still laying. Thomas Gracie chuckled as he moved passed the young man. He glanced up to see a break in the leaves, allowing a glimpse of full moon. It’s pale light filtered over parts that were clear of shadows, but beyond the thick foliage of towering forest there was not much else they could see. Shafari reached into the snow to where his spherical light had dived. Fingers groped in the cold, unsure if where the light led was accurate or not. Had one of his friends become buried? It had finally stopped snowing, though every now and then a brisk wind stirred up any loose flakes in the air. Most of the tracks made from earlier were still visible enough to follow without the need of light bobbing in front of his face. He clamped his teeth together to keep from chattering against the cold, fingers numb from rummaging in the snow longer than he wanted. At last, he clamped down on something smooth. Just as quick, the light popped back out, throwing bits of snow in the air when it did. As if to reply, the orb darted to his right, following a second set of prints to an opening in a rocky hillside. Shafari turned to follow and looked up at the mouth of the dark cave. He let out a quick sigh. Without hesitation, the light sped down the left tunnel. Not expecting the swift response, he hurried after its trail of glowing dust. Its reaction to his request worried him that one or both had become injured on their quest for shelter and a way around the blocked road. Nick would have a fit if I brought two more injured into the mix of what we already have. He thought back to the doctor waiting at their makeshift campsite. When he had felt the tug of Jenario’s tracking stone, he knew something had happened. Just the mention of venturing out to check caused a series of demands to make sure he knew what he was up against in this weather. A dead end did not deter the orb from its path. It hesitated only a moment before swooping into a connecting tunnel. As Shafari stepped through the opening, he was immediately aware of several colored symbols that lit in presence of his light. For a brief moment, the tunnel remained devoid of movement. Gradually, however, the light returned with a slight droop to its motion. As though ashamed of its behavior, it dimmed and hung low while approaching the magic-user. Shafari gave a sigh and just shook his head when the light darted around the bend. It soon returned when it realized he was not following. “Better.” He gave a crooked smile and continued past the symbols, wondering if his friends had also noticed them. Elements are nothing to mess around with. I wonder if they set something in motion by coming here. With that thought in mind, he was careful to check for more while ducking under a family of long stalactites. The uneven floor crunched with bits of dirt and loose stone under his boots. When the crack of glass replaced loose stone, he called for his light to check around where he stepped. It did not take long to discover the broken lantern scattered across the floor. Shafari’s breath caught in his throat. In panic, his voice croaked out their names. He followed the orb, which darted this way and that at its master’s hectic calls, until it paused in front of another opening. Halting in mid-step, Shafari watched it dim and hover just inside the passage. Strangely enough, a blue glow seemed to wash over the walls. The outer edges of the opening hinted a secondary light source, though he knew it was not from an ordinary lantern. Why is it warm here? Shafari stepped to where his orb hovered and lifted a hand to extinguish it. “I’ll bring you back, don’t worry,” he whispered, peering into the spacious chamber. It was the oval mirror that captured his immediate attention, and when he came closer it revealed the same secret his two companions had discovered earlier. Shafari looked on in curiosity as the mirror showed where his friends were through the portal; however, he himself did not enter. A weave of hand left a fiery message scrolling across the floor for the two to discover when they came back. Then, with a grin of satisfaction, the magic-user let his guiding light lead him back to camp. “I don’t like this.” Tia’s expression was nothing new when it came to magic. That look of contempt could make any man feel ashamed, and Jenario was no exception. Ever since the group was brought into the cave, and with news of a portal within close proximity, Jenario had heard every excuse not to go near it. Even into early morning, Tia harped on the subject of him disappearing into a world they knew nothing about. “I don’t like it either.” Jenario hoped his confession would appease her for the time being. He glanced around at those huddling near the fire. The cave had served well for shelter during the winter storm, for it was back up to howling across the opening again. A torn canvas flap from one of the tents served as a door to keep out as much cold air as possible. Still, it was better than digging in the wet snow trying to get a fire going. The clink of ladles dishing out warm broth suggested it was time to get moving with their next line of duties. Jenario rubbed his cheek in pretend hurt where she had slapped him. He leaned in for a farewell kiss, only to be greeted by empty air as his fiancée retreated to where their son lay resting. With a heavy sigh, Jenario pulled a pouch over one shoulder before departing down the familiar passage containing the portal. He found Shafari leaning up against the wall just outside the portal’s chamber, leg crossed over the other and a long pipe stuffed into his mouth. A white haze puffed out at the tip, some unholy matter that made Jenario queasy whenever the smell hit his nose. It did so now with a force that nearly made his stomach turn inside-out. Shafari pulled the pipe from his mouth and licked his lips to savor the taste of smoldering herbs. “She gave you an earful, didn’t she?” He cracked an all-knowing grin. Jenario’s face remained devoid of emotion. Holding his breath, he stepped past his reeking friend to join Thomas Gracie and Nickademis, who were making final preparations. “Took you long enough,” Nickademis greeted with a somewhat serious tone. “Though I don’t blame you. Trusting unknown magic can be dangerous, and you know that’s not something I delve in should anything happen while you’re on the other side of this thing.” He jerked his thumb in the direction of the portal. “You know Tia.” Jenario just shook his head. “Aww. Someone’s not giving me credit.” Shafari tapped out the remains of his pipe and stuffed it in one of his belt pouches. “I’m glad I didn’t add anything else about you,” Jenario admitted. About to counter, Thomas Gracie cleared his throat. “You have the list of ingredients?” Nickademis nodded when Thomas Gracie held up a piece of paper. Jenario glanced over the list, all of which were the same type of plants studied through alchemy. “What? !” Jenario and Nickademis stood in shock. Shafari, however, seemed pleased. “Won’t explode in my hand, will it?” Nickademis stared at three white pebbles lined across a rocky platform jutting up from the cave floor. It was hard to believe such a small thing was so important. Yet his suspicions of impeding concerns grew more apparent the longer he held it. Is this thing getting hot? “Ack!” He let it drop when it suddenly flared red. It smacked the corner of uneven stone flooring and bounced away from him. It did not get far, as its heated surface began to warp into a molten pool of red goo. Once through the portal, Jenario studied the list of ingredients: red clover, yarrow, jewelweed – the list went on of herbs needed to help with sore throats, coughing, all the symptoms his son and others had developed. But will I recognize them as much in the wild versus being delivered fully cleaned to my lab? He looked around at the plentiful vegetation growing in and around the mouth of the cave and along tree trunks. A wide variety of fern covered the majority of space, with patches of nemorosa sunning their yellow and white faces in the early morning light. There was a sense of serene dignity about the forest. Unlike the night before, Jenario savored the light that pushed back shadows and allowed a glimpse into a new world. The trees themselves seemed taller, thicker, their bark stretching up into a canopy filled with large, green leaves. Here and there, small birds fluttered from one branch to another. Their energetic songs triggered an intense chatter above their heads. No doubt, our strange appearance probably alarms them, he reasoned. A series of fir trees and holly caught his interest along one side of the cave. The ground angled slightly downward where they stood, taking his eye along a path of dry leaves and bramble. The way grew relatively darker farther away from the cave, and he hoped his search led him elsewhere. Straight out from the portal’s standpoint, a natural trail of roots and smaller foliage seemed more reasonable to follow. Doubt edged its way into his heart. In Mayla, people brought him things already gutted and cleaned. LIke fish, he thought grimly. They never let me study anything properly. It was just what they wanted me to see. With the plants already tampered with, there was no telling whether valuable ingredients had been left out. Now he was to find the plants himself in their true beauty. Where to look, however, was another question. “Everything all right?” Thomas Gracie noticed his friend’s puzzled expression. “Uh…yeah! Yeah, it’s fine. I’m just…not sure where to start looking for this.” By then, Shafari had finished his little rant with the doctor. He stepped beside Jenario to glance over the list with him. “Your charm’s about as good as my boot, you know,” Thomas Gracie said with a wide grin, and Shafari laughed. Amber eyes peered down through the dense treetops. A new scent peaked its interest to scan along the ground where three humans had appeared. Nostrils flared to take in the strange smell. When it exhaled, dark lips parted to reveal a set of fangs. It adjusted itself along the limb, a russet flesh tone speckled with the same colors as tree bark. Curious, a crest of feathers stood on end to complete a look of shadowed leaves. Taloned fingers dug into the wood as it skillfully made its way after the strange men. When it could go no farther, dark wings unfurled into a silent glide to the next tree, only to slip back into shadow. It sniffed the air again with an inner hunger that lit its eyes. Like two yellow orbs, they blinked once beneath the shadowed foliage before fading completely. “Wouldn’t the council love to know where we are now!” Shafari laughed. He paused to examine some wild berries. “Are those..?” Jenario studied the small fruit that Shafari held up. With a sigh, Shafari let the subject drop as Thomas Gracie took lead. “Do you know how?” Jenario whispered back, and in return received a wide grin of confidence. With a sigh, he glanced over the list again, then around the area. There came a sigh before Shafari swiped the list from his fingers. “And you’d recognize them?” Jenario crossed his arms. “’Course I would…with a little help.” Shafari cracked a grin. Jenario felt Thomas Gracie’s gaze scanning over him for any signs of opposition, so he tried to his best to keep a placid expression. Jenario’s head was spinning. Separate? We don’t even know where we’re going! He wanted to shout in protest but decided against it. Yet the moment they were out of ear-shot, the young man was yanked up against a tree and pinned there by Shafari. “What are you doing? !” Jenario demanded, but Shafari just held a finger to his lips for silence. When no sound came from their companion’s direction, he released his friend’s shirt. “Don’t you see the potential in this place? We don’t need supervision from another to tell us how or when to use our talents.” At this, he spread his fingers to unleash a dance of crimson fire that caught the excitement in his eyes. “The council cheated us – you especially. They should have enhanced your alchemy. Without that, we don’t have ways to define medicines or even formulas for what few magic-users are actually in our group. As it stands, I believe I’m the only one who still practices.” He stepped away, and when he did his hand clenched to extinguish the flames. Jenario studied him, letting his words find meaning as he replayed the scene in his mind. One thought led to another, and before he realized what he was saying, the question of Tia’s brother popped up. “Did the council have anything to do with his death?” He let his gaze trail along the ground while he waited for an answer. He had yet to see one ingredient on his list while vegetation grew denser the deeper into the woods they went. “Is that possible?” Jenario cocked his head in curiosity. Briars clung to their pant legs after wading through thick underbrush. Finally, they came to a stop. When they peered overhead, the canopy seemed to engulf them in the shadows of close-knit trees. Strange calls carried on from animals they could not see. Jenario could not even place a single one. Was it bird, or beast? “I think now’s a good time for some help,” Shafari said. “What say you?” He lifted a hand to call forth his orb. The light of its bobbing form was comforting, as they could see into the deep shadows around them. The spherical light darted around its master as though in delight. Then, as if noticing Jenario for the first time, it swirled around the young man in examination. “Can it actually read? Like a person?” He held up the list. In response, the orb hovered slightly above the parchment. Each word encountered triggered a pulsing glow until it had scanned over the entire list. It then returned to its owner. “Think you can manage?” Shafari motioned to their surroundings, to which the sphere immediately began scanning for traces of required herbs. He raised an eyebrow when the sphere’s light pulsated in a sort of giggle to his explanation. “So in a sense, it’s alive,” Jenario said. They watched the orb dart over a wall of bramble. Jenario knelt to see if he could peer under when Shafari’s orb suddenly shot out of the opening. While Jenario yelped in surprise and fell back, its master was busy trying to calm its wild behavior. “What has gotten into you!” He raised a hand and threatened to extinguish it. Shafari was still fussing when a snap of branch caught their attention. Between the shadowed trees, two yellow eyes blinked back at them. The hiss came again, causing the orb to dart behind its master’s back. The eyes followed, intrigued by the glowing object. Both men remained frozen while a large creature crept into view. A black stripe ran from forehead down to its russet chin. Nearly three times their size, Jenario thought it resembled a muscular human with feathering covering its chest and underparts. When it rose on its hind legs, a pair of dark wings opened to help balance the action. Black lips parted in a throaty growl as it studied them. Jenario nearly choked. Were those fangs? What about you! Jenario wanted to yell. Instead, his gaze flicked toward the magic-user, then back at the creature. It sniffed the air before stretching out a clawed hand. Its large, upper body teetered to one side at the shifting weight, but with the wings acting as a counterbalance, it was soon creeping toward them. Those talons have gotta be four inches long! We’d be dead in one strike! Flickering light drew his attention to Shafari. The orb pulsated even brighter. While its master raised a hand to control the effect, it now held the creature’s full interest. “Go!” Shafari shot the orb forward. Caught off guard, the it nearly toppled backwards. Wings opened in full display of power as they beat the air to keep upright. Thorny bramble shredded on impact, and was continuously pommeled by its powerful strokes to maneuver into a counterattack. The orb darted around its face, keeping it distracted while the two men made a dash for the opening. Jenario dived first, kicking up dirt as he pushed himself under. He clawed at the ground when he felt thorns scrape across his leather vest. They did not catch, however, and he scrambled to his feet. When he turned to check Shafari’s progress, he found him already halfway under. Suddenly, he reached out for help. “I’m stuck!” There was no need to guess. Jenario already knew the crimson fabric had snagged as he quickly grabbed hold and tugged. A blood-curdling scream of rage stilled Jenario’s breath. He felt the cold pang of fear clouding his better judgement when an explosion of light meant the orb had extinguished. Panicking, Jenario about wrenched his friend’s arms off trying to get him under. There came a rip of fabric before the two fell back at the sudden release. Just in time, Shafari’s feet cleared where claws gashed into the earth. “Go go go!” Shafari was on his feet faster than Jenario’s thoughts could process. As the two started running, Jenario tried to make sense of a silhouetted form rising above the bramble. Wings, he reminded himself. Right – it can fly. It had been too dark to see what they looked like other than a dark mass of feathers. But can it fly through a dense forest? The two men dashed through the trees. Jenario’s heart pounded to the beat of his own feet crunching over decaying leaves and twigs. A little ways to the right, Shafari darted between trees. He was ahead by two strides. Sunlight was sparse. Aside from his own heavy breathing, there was no telling whether the thing was following or not. He slowed, nearly impossible to detect movement with the pounding in his ears. He turned a full circle, hoping to catch sight of his friend. “Di cu’ niédo,” a deep-throated voice answered. Jenario froze. His eyes flicked between the shadows until movement pinpointed its location. “You…speak?” Blood drained from his face. It followed that fast? He watched it creep closer, a dead weight in his feet preventing him from moving. Once again, those wings opened as a counterbalance to offset its lumbering form. Why is it so calm? Is this one different? It spoke again. Its words slurred in a growl that could have been speech, but for the heavy dialect Jenario was not sure. To him, they were simply a mix of deep-bellied grunts. Filtered light played over those each talon digging into the earth. Jenario took a step back. A flash of red flicked his gaze to the trees. Fingers curled around a trunk, glowing with the familiar power of a magic-user’s wrath. “There are two? !” Jenario hardly got the word out when a crash of foliage directly in front of them turned their course. “And they’re apparently working together!” Shafari grimaced when a pair of large, black wings opened across their path. The two men skidded to a halt, with Jenario nearly plowing into his backside. “Use a different spell!” came his hoarse whisper. “I’m trying here!” Shafari gritted his teeth while the winged creature proceeded to charge. He had just raised a hand to call forth another fireball when its sudden stop threw up bits of dirt and dry leaves in his face. Jenario cowered behind his friend, who hastily wiped around his eyes. Once clear, he commenced another incantation, then fell silent. Although the creature had risen to full height, its gaze was not centered on them, but the approach of another. A bone-chilling growl made them turn to find a second one preparing to pounce. “Get down!” Shafari pulled Jenario to the ground as the two winged beasts dove at each other, snarling and clawing. Feathers flew everywhere. Their muscular, upper torsos took each other’s blows with ease, and was the perfect distraction for the two men to slip away. Yet at every attempt it seemed the creatures were tossing each other across their path. Jenario ducked a claw swipe that dug a long ditch through the dirt. He could feel Shafari’s grip to the back of his shirt trying to moved him from harm’s way. “Watch it!” Jenario heard, before he felt a shove just as a wing back-slapped Shafari into a tree. While the push sent him careening into some underbrush, he at least was out of the fighting. Shafari, however, was not. He lay with his back against a trunk, tenderly holding his arm. His face contorted into a look of both concentration and pain. His lips moved, but when Jenario he could not make out the words he realized Shafari was casting a spell. Between sounds of exploding foliage and wild screeching, Jenario was not sure who struck first. When he came to, he was on his back with a strong odor of smoke lingering from the blast. Slightly dazed, he scrambled to find his footing. Screeches of anger filled the air while a large chunk of shredded wood obstructed his view. A horrible screech answered instead, and it was all Jenario could do to keep from tripping over his own feet to get away. From behind, he heard bark ripping down the side of a tree. Tears stung his eyes, sure that his companion was dead. Yet he dare not slow. Jenario kept looking up into the shadowed leaves, terrified something would drop down at any moment. Branches swatted him across the face. Somewhere, claws clapped along overhead boughs. It’s too fast! Suddenly, the trees opened to a moss-covered clearing. Every place he looked was coated in green. It hung from branches overhead, clung to logs across his path, but it was far better than traveling in the dark. He kept going when a thrash of limbs and foliage suggested the creature had broken through behind him. Jenario sprinted once out in the open. Yet here, there was no place to hide. A dead tree covered in hanging moss perched next to a set of large, flat rocks. Like a staircase, they stacked up against the tree as though meant for climbing. The beating of wings grew louder, and he hew it was on top of him. In the midst of his mad dash, he scooped up a rock. Courage was slim to nil at this point. Still, he closed his eyes, whirled on his heels and threw as hard as he could. There came a thunk of solid hit, followed by a shrill cry that paralyzed him other than to cover his ears. Something smacked into him, and he went flying back. He landed hard and opened his eyes to find himself in a similar position with his back against the dead tree. Yet Jenario knew his end would not be the way Shafari went. There was no dramatic spell he could cast for quick release. His side ached where the thing’s wing had probably cracked a few ribs. Trying to move brought unbearable pain. All he could do was wait. Thomas Gracie’s probably dead, too, he thought in despair while watching the creature finish rubbing its feathery face. Amber eyes finally turned his way, the pupils little more than slits. A snarl of anger revealed a set of fang while other features stood out that Jenario had not noticed in the concealing shadows. It looked a bit awkward as it stood upright like a human. Its upper torso was a massive mound of muscle meant for pumping those huge wings. And yet it did an extraordinary thing by folding them into a fade. Jenario stared, his pain forgotten. The wings…were gone! The translation from one dialect to another nearly stole Jenario’s breath. Jenario’s gaze flicked to the ground for another stone, but there was nothing close to where he could reach. He could only watch it approach with tears streaming down his cheeks at impending doom. He pressed himself as tight up against the tree as his body would allow and closed his eyes when a talon aimed for a final blow. A vibration along his spine suggested something was moving, though he paid it no heed while awaiting death. When that blow never came, however, he gradually opened one eye to see why it had stopped. Another pulse along the tree trunk caused for alarm when the creature’s gaze no longer fixed on him, but the tree itself. A low-bellied rumble shuttered from the top portion of the trunk. Petrified at what else had possibly flown in, Jenario craned his neck to look up. Another rumble shook the tree down to its roots. Something extended from its inner core. He could feel it pressing it up against his back as a bulge made its way out. Branches pulled to either side, resembling that of mossy wings instead of decaying limbs. When the protruding part finally slowed, Jenario realized it was a neck that stretched out over him. Like a turtle emerging from its shell, its features came intact with a crest of mossy scales that resembled the color of bark. The lighting that shone down in the clearing reflected off a set of elongated teeth that held his attacker at bay. Though its teeth extended into root-like points that grew directly from the jaw, it nonetheless would inflict the same amount of damage should its bite dig into flesh. A…dragon? Jenario guessed, but the story depictions he had grown up with did not match the appearance of this tree-residing snapping turtle. The length and shape of its skull did not match a sleek fire-breather. Still, the use of mossy wings suggested a dragon variation, though being so close to one was nonetheless terrifying. Amber eyes flicked between prey and dragon. Taloned feet scooted back an inch to get its bearings before unfurling its wings in a push-off dash for flight. Just as quick, scaled neck lashed out and snatched it from mid-air with a bone-crunching snap! The horrific scene of flailing arms and flying feathers was cut short. Jenario did not even hear a whimper as the dragon simply lifted its head for its catch to slip down its throat, yet not before one of the wings flopped to the ground. The last thing he saw before fear drowned everything else out was its hollow gaze turning to stare down at his frail form scrunched up against the base of the tree.